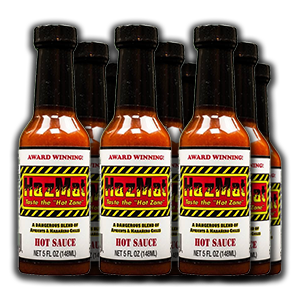 HazMat Hot Sauce | Hazmat Hot Sauce - Taste the "Hot Zone"
Are you ready for the best hot sauce you’ve ever put in your mouth? We think so. Order a bottle and find out. WARNING: Consumption of single bottles of HazMat have been known to lead to ordering entire cases. We start with delicious apricots and then blend in the perfect mixture of garlic, bell peppers, carrots, and lemons to make the rich flavorful base. Then we hand that of to our expert team of pepper wranglers who add just the right amount of that wonderful habanero flavor and heat to get you going. We squeeze all this explosive flavor into a 5oz. bottle and send it on its way to add that mouthwatering kick to anything and everything you can think of to put it on. This stuff is amazingly delicious on a Mission Street burrito! This San Francisco resident thanks you! Where do we find the best burrito in the Mission? Amazing… This is better then Franks, wish we could get it locally in Nashville. If you know any places in Nashville looking to have some great hot sauce please let us know! A very delicious addition to just about anything you put it on. Won’t set your hair on fire, just a nice, zesty flavor. My friend Mike G gave me a bottle to try and I am addicted. 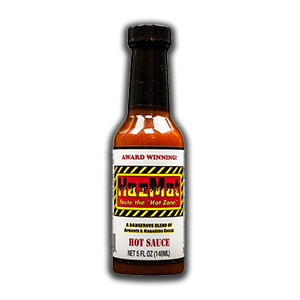 I am a hot sauce aficionado and this is the best hot sauce I have ever eaten. I am going to purchase enough bottles to share!